Today, I bought an Apple Airport Express. And I can say I’m very very impressed! 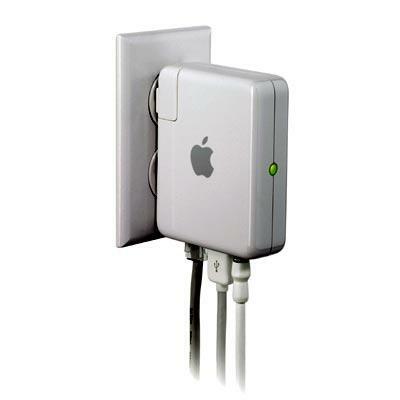 The Airport Express is tiny and plugs into the mains directly (there is no need for an external transformer.) It is a fully-featured Wifi 802.11n access point (which means it has theoretically five times the bandwidth of a 802.11g device like the MyT Livebox) which can also work as a simple bridge (if you already have a router with a DHCP server for example which is true for the Livebox.) Personally, I’ve connected mine to my MyT Livebox and disabled the Wifi on the latter. If you look at the picture above, you’ll notice three cables: an Ethernet cable, a USB cable and an audio cable. The Ethernet connection is used to connect the Airport Express to the Internet (the Livebox in my case.) The USB cable connects to a printer and the latter immediately becomes available through Wifi (the Airport Express essentially contains a print server.) As I have one USB printer (a HP P1006 black and white laserjet) at home and three computers, I think I’ll use that a lot. And where does the Airport Express get the audio? From any application running on any of your computers! Out of the box, it works with iTunes (which I use for listening to my MP3s and AACs) and I can say it works flawlessly even when moving my MacBook around the house. To be honest, I had to stop using a dashboard widget, Airport Radar, because it is incompatible with the Airport Express but that’s not a big deal. Interestingly, I can also listen to all the Last.fm radio stations using iScrobbler because the latter uses iTunes to play the audio. 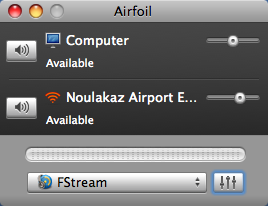 With the addition of the $25 Airfoil, it becomes possible to stream the output of any application to the Airport Express. For instance, I’ve streamed the audio from Safari and Firefox when watching YouTube videos. I’ve also streamed audio from FStream and RealAudio Player which I use to listen to internet radio. In the US, the Airport Express costs $99. In Mauritius, it’s more expensive (obviously) and I’ve managed to get one at Rs 4300 + VAT at LCI. Personally, I find the price acceptable. LCI makes a Rs 800 profit and gives the VAT to the Governement. Incidentally, I don’t feel cheated when purchasing an Apple product because they tend to be great (this is true of my iPod Nano, my MacBook, my Logic Express and now my Airport Express) and they really work out of the box. For instance, to configure the Airport Express, I didn’t even have to run a cable from it to my MacBook. It was immediately detected and the default configuration just worked. Nice! What I really miss from apple and/or rogue amoeba is some sort of airfoil speakers for the iphone platform. Does this work with a PC? I could kill for one of those new iMacs.. I like your way of thinking: nor urging your parents to buy you one. You don’t necessarily need an Apple product to get the job done. If you can afford one, good for you, but if you can’t, it’s not the end of the world. The reason why I could afford a MacBook was I got student discount in Canada. And at that time, I did not own a car, a house and I did not have a child. Today, I do. If I were to buy my first Mac today, I would think twice before doing so. They are still more expensive. I know some will say that comparable specs in the PC world cost about the same. Yes, it’s true, but the truth is for what I use my MacBook, a $500 Toshiba laptop will do just fine. You see, I’m a part-time student at U of Waterloo. With a full-time job and a baby, I have very little time to devote to studies. iLife is the last thing on my mind when I sit in front of my computer. That being said, OS X is much better than Windows when it comes to working with multiple windows both on a small screen and a large screen. Once you get used to Exposé, its hard to imagine how it would be like to not having it. If one keypress or a mouse click, I can see all my opened windows. Nice baby! Love it. And it has turned your home into a mauritian (the 12th is approaching – we should mention the word lol) ubiquitous multimedia playing house. This is cool! Can you provide access to your songs (held somewhere in a folder) publicly? I’d love to read in the papers – Avinash Meetoo, inventor of next gen on-site (not remote) concerts in web 2.5 environment. Some multimedia content are accessible to the public – people who walk by your house can listen/watch them. Or you can stream news or your audio content of your tweets using a text to speech software which makes text sound like being spelled by Prof. S. Hawking’s computer, to those who walk by. That would be so cool. This baby can even be used as an advertising platform. I think I’ll get one later this year when another mac is released. Anyway, the baby just rocks! If you can get someone to buy it for you from abroad, it will cost cheaper. It’s even better when it comes to Apple laptops. I must confirm, but I think Apple laptops carry a one-year international warranty. You’re right Patrick. Apple MacBooks have 1 year international warranty (meaning that they can be repaired in any Apple certified repair centre.) At the end of the first year, one has the possibility to acquired AppleCare which is a 2 year warranty extension. Personally, I bought AppleCare for my MacBook in Malaysia but I had a lot of problems to activate it as it seems that the resellers we have in Mauritius are not *real* Apple resellers and, as far as Apple is concerned, the MacBooks bought from them are not really bought (whatever this means.) I had to make 4-5 calls to Apple Australia (fortunately from Malaysia) for them to accept to activate mine. Just to clarify, AppleCare has to be bought and activated before the end of the first year. Too bad Apple resellers in Mauritius are not really “resellers” whatever that means. Since you got AppleCare, does that means that the Apple resellers in Mauritius will still cover it? By the way, don’t you just activate AppleCare online? I guess it’s best to buy AppleCare together with the Mac, and activate it right away if you are going to take it to Mauritius. The reason why I did not extended warranty for my brother’s Dell was that Dell told that they would only be covered in Countries where Dell has a store, not just being resold. AppleCare can only be acquired during the first year. I checked with LCI and they told me that they would repair my MacBook in case something happens because of the AppleCare extension. But as nothing bad has happened yet, I cannot vouch for this. As for online activation, that’s where the major problem is. When I tried to do that in Malaysia, Apple’s website didn’t recognise the SN of my MacBook as one which had been sold. Like I told you, I had to call Apple Australia and tell them how I got mine from Mauritius. Initially, they told me that they were not going to activate AppleCare. I had to, ahem, tell them that I regularly visit France (where there are real Apple resellers) for them to accept to activate my AppleCare. So it would seem that the Mauritian Apple “resellers” are not real resellers. But I may be wrong and maybe things have changed now. That’s weird that your MacBook is not registed in Apple’s database as one that was sold to a customer. Have you checked with LCI why your unit did not register as sold with Apple? I didn’t check at that time (because I was in Malaysia.) When I got back, I was so happy to have AppleCare that I didn’t really thought about asking LCI. When I meet the LCI GM, who is a good friend of mine, I’ll ask him.